Flensted Mobiles: Life & Thread Ceiling Mobile. This is one of our most popular mobiles! The Life & Thread mobile from Flensted has classic appeal with its timeless primary colors. Gravity seems to have no effect on this mobile. This Mobile was created so that the elements are in constant motion while the entire Mobile maintains a harmonic balance. Watching the slow motion of a mobile is a remedy against stress. Each mobile is carefully assembled, and balanced by skilful hands. They are packed so that they are ready to hang. They make a great present for your family, friends, children or yourself! Flensted mobiles are designed and hand made in Denmark. These Danish mobiles are famous for their simple, elegant and non-obstructive Scandinavian design style. A Flensted mobile is a perfect remedy against stress. These perfectly balanced ceiling mobiles will move with only the slightest current of air. 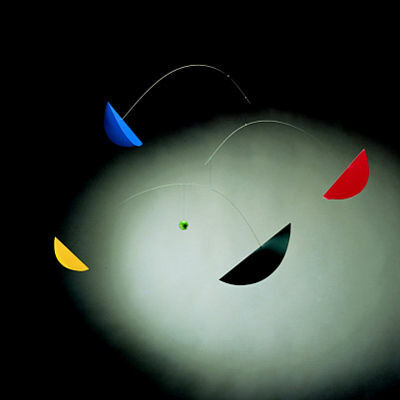 The individual parts of the ceiling mobile move in a gentle orbit with a string that is nearly invisible. The Flensted family was the first to construct and market them commercially for the single purpose that they could be available to everyone at a reasonable budget. Flensted Mobiles designed their original mobile featuring a stork motif, and it continues to be made and sold internationally. Flensted Mobiles are the perfect addition to your home decor be it a living room, bedroom, nursery, office, etc. These ceiling mobiles make great gifts too since they come packaged in a nice cardboard box with presents very well. Material: plastic, steel roods, beech ball. In stock, usually ship in 1 business days.